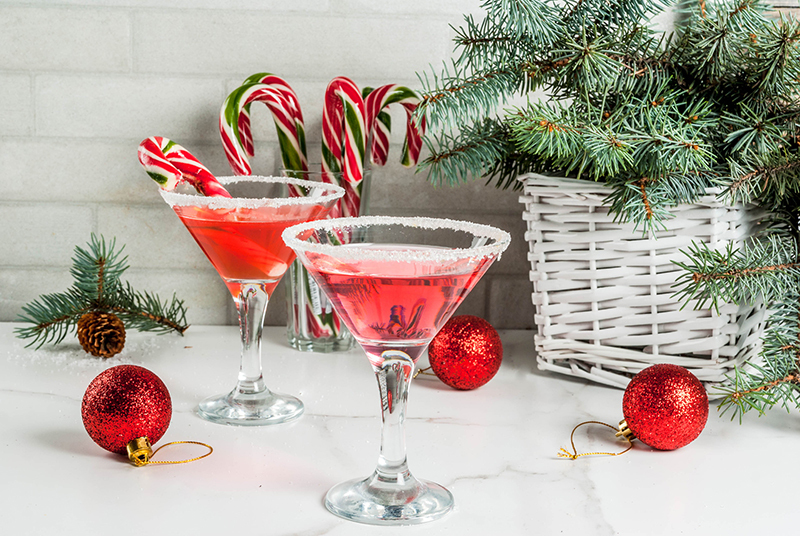 1Pour 1 tablespoon of Sugar Cane KISS onto a small plate and dip the rim of two martini glasses in it, to moisten. 2Place crushed peppermint on a separate plate roll the coated edge of both glasses, to coat. 3Pour a splash of pomegranate/cranberry juice into each martini glass so it settles on the bottom. 4Pour vanilla vodka, Sugar Cane KISS and peppermint schnapps in a shaker with ice. 5Shake vigorously and strain into martini glasses. 6Garnish with mint sprig and candy cane, if desired. Such a visually-appealing drink. Simple to make, too! To crush the candy cane without making a mess, break it into a few small pieces then place it in a zip-lock bag. Use the edge of a drinking glass, or metal spoon, to gently press the candy so it becomes small crystals. * To make your own vanilla-infused vodka: carefully split a vanilla bean with a sharp knife to expose the beans, then drop it into a full or partially full bottle of vodka. Let it soak for a good day or so for the flavor to infuse the vodka.